The description I am about to write relates to what I think children have to do when they are beginning to learn to read and write using phonics. In particular, it is about what they have to do when learning how to abstract phonemes from words. I was motivated to write some easy books because my grandson could not remember all the words he came across in the books he brought home from school, even though he had ‘done’ synthetic phonics and he knew the sounds corresponding to the letters of the alphabet. After devising some texts made up of a few sentences containing rhyming words, e.g. cat, is, a, on, mat, pat, sat, rat, hat, and trying these out with some children, it became clear that some of the children could not cope with all the different letter symbols at once. I resolved to find a simpler solution to this problem. 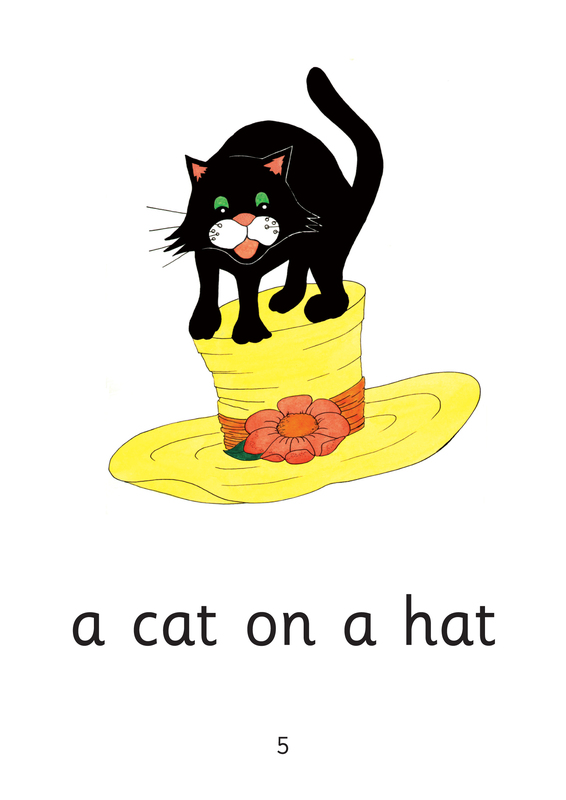 I worked out that if I began with the words ‘cat, mat, hat, on a’ I could write and illustrate an eight-paged book containing seven symbols and five words only. Also, the three words ‘cat, mat, hat’ were concrete nouns and they could all be illustrated. On the first page of the first book I introduced the words ‘a cat’. These words were illustrated with the picture of a cat. I thought it was important for the children to see the picture as well as the words so that we both knew exactly what we were talking about, i.e. one cat. I found that most children could remember the word ‘cat’ as a whole word when they saw it written on a flash card with no picture. However, my aim was to teach children to read using phonics – the correspondences between letters and sounds. This meant that we had to split the word to show which letter corresponded to which sound. But when they learn to read and write children have to notice that they see three separate symbols in the written word ‘cat’, and, at the same time, they also have to notice what they do with their mouth, lips and tongues when they say the whole word. They have to notice three different actions going on in their own mouths – the click of the tongue at the back of the mouth when they articulate ‘c’, the open mouth, expelling both air and sound from their vocal chords when they articulate ‘a’, and their teeth coming together as they articulate ‘t’ at the end of the word. Because humans speak in syllables, the children will find it easy to say ‘ca’. Trying to say a sound that corresponds to ‘c’ by itself is actually impossible. By saying ‘ca’, children can notice what they have to do when they try to add the ‘t’ at the end of the word. In this way they can identify ‘t’ as the last ‘letter/sound correspondence’. They will also be able to articulate ‘a’ very easily, because it is a vowel, and all vowels are syllables. They will also have realised that they make a clicking sound at the beginning of the word and that this must be the one that corresponds to the symbol ‘c’. In this way children should be able to identify three actions they do in their mouths when they say the word ‘cat’. Being able to identify these actions – and that they have articulated a ‘sound’ with each action – means that they will have ‘abstracted the phonemes’ from the word. They will be ‘phonemically aware’. They will have learnt a ‘sound’ corresponding to each symbol and they will be able to say a ‘sound’ corresponding to this symbol when they write it. It is not essential for children to be able to do this when they first meet the word ‘cat’. Some of them will simply see ‘cat’ as three symbols written together in a specific order with a space either side and remember that it represents the spoken word ‘cat’. They will have read it as ‘cat’. It is the practice of writing ‘cat’ that helps them to identify the letters (graphemes) and their corresponding ‘sounds’ (phonemes). The next page in the first book has the words ‘a mat’ and a picture of a mat. First of all, we must establish that the word ‘mat’ is in the children’s spoken vocabulary. When this has been done and we all know what we are talking about, then we can try to work out what we do within our mouths when we say the word ‘mat’. The word ‘mat’ only has its first symbol different to the word ‘cat’. Children have to be able to notice that they squeeze their lips together when they articulate ‘m’. Some children will have noticed the difference in what they do when they say ‘mat’ and ‘cat’. They will be learning what to do within their mouths when they see the symbols ‘m’ and ‘c’ in simple words. They will be abstracting these phonemes from words. The next page in the book has the words ‘a hat’ and a picture of a ‘hat’. When saying the word ‘hat’ children have to notice that they breathe out (expel air) at the beginning of the word, and that this action corresponds to them seeing the symbol ‘h’. The rhyming ending ‘at’ is the same as in ‘cat’ and ‘mat’. By using these rhyming words, only one new phoneme has been added on each of these two pages. If children are able to identify how they articulate these phonemes, then we can say they have gained phonemic awareness corresponding to the symbols ‘a, c, t, m, h’. If children remember ‘cat, mat, hat’ as whole words, then by practising writing them, they will soon be able to pick out the sound correspondence for each letter. The next page in the book has the phrase ‘a cat on a mat’ and a picture of a cat on a mat. This phrase reinforces the concept relating to ‘a’ as a word meaning ‘one of’. It also introduces the concept that ‘on’ means one object on top of another object. By talking to the children about the phrase, we can make sure that they understand it. So, the only new word on this page is ‘on’. Some children will remember it when they see it written down as a whole word, but as they practise writing it and saying it, they will be able to split it into its letter/sound correspondences for themselves. They will notice that when they open their mouths to articulate the ‘o’ in ‘on’ they do not make the same sound or action as when they articulate ‘a’. (Until they get to this point they are not going to be phonemically aware.) Also they should notice that the action, and resulting sound, at the end of the word is not the same as when they said ‘cat, mat, hat’. They would probably expect this because the symbols ‘t’ and ‘n’ are different. Nevertheless, these differences have to be noticed for children to become aware of the letter/sound correspondences. Personally, I think we are asking a great deal of little children here, and I would be happy if they just remembered ‘on’ as a whole word and they knew what it meant. There are no more new words, letters, sounds or phonemes needed for children to read the rest of the pages in this first book. They have met the letters ‘c, a, t, m, n, o, h’ in the words ‘a, cat, mat, hat, on’. I would be happy if they could read the words and practise writing them at this stage. Whilst they are practising writing them they will also be practising how to form the corresponding sounds in their mouths. The next book, 1B, a man, does not introduce any new letters. However, it uses the words ‘man, cot, hot’ as well as ‘mat, cat, hat’, so children have to look carefully at the spellings of the words and the pictures to realise that these words are different. They can see that a change in one letter makes that particular combination of letters refer to something completely different. It is the difference in the meaning of the words, explained by the picture, that draws their attention to the letter combination. ‘Man’ only differs from ‘mat’ by its last letter. ‘Cot’ only differs from ‘cat’ by the middle letter, and ‘hot’ differs from ‘hat’ by the middle letter also. The pictures for the phrases ‘a cat on a cot’, and ‘a cot on a cat’, explicitly show children that not only are the written words ‘cat’ and ‘cot’ different, but also that the order of the written words on the page matters. The picture for ‘a cat on a cot’ is different to the picture for ‘a cot on a cat’. Children will be able to relate this to the meaning of each phrase. Also, by now children have had more practise in differentiating ‘a’ from ‘o’, and they may be able to abstract the phonemes from the word ‘on’. In the next two books I introduce the words ‘box, big, in’ so that children can identify and abstract the phonemes corresponding to the symbols ‘b, i, g’. (I did not add ‘x’ to this list as it is not a single phoneme. It is made up of two phonemes /k/ and /s/. However, I have never met a child who had a problem saying ‘box’.) The concept word ‘in’ is used in this book and not ‘on’. All the pictures are of one object in another object. The next two books introduce the letters ‘d, f, l, r’ in the words ‘dog, log, frog’. These particular words are reinforcing ‘o’ and ‘g’ from the previous books. The concept word ‘and’ is introduced. I suggest children learn it as a whole word. We finish off the series introducing the letters ‘e, u, s, p’ and the concept word ‘the’. ….. And at that point we realise that all the hard work we have done abstracting phonemes corresponding to symbols in simple words doesn’t help us with the word ‘the’ because ‘t’ is not pronounced in the same way as it is in ‘cat’, ‘h’ is not pronounced in the same way as it is in ‘hat’ and ‘e’ is not pronounced in the same way as it is in ‘bed’. What do we tell children now? To my mind, there is no way round this. Children have to learn ‘the’ as a whole word written with the three symbols ‘t, h, e’ in that order. They have to visually memorise it as a whole word in the same way as they memorise lots of written words. I suggest that many children learn to say whole words when they first see them written down. They have to be made aware of what is going on in their mouths when they say these words and then which letters correspond to these actions if they are to become phonemically aware. Some children learn to do this by themselves when they are practising reading and writing but in phonic teaching methods they are all taught this awareness. In synthetic phonics children are first taught the ‘sounds’ (the separate phonemes) and how they correspond to letters (the separate graphemes). Then they are taught how to blend the sounds together into a compilation which triggers off something in their head to relate it to a whole word they know from speaking and listening. The letters are always thought of as spellings of the sounds. The beginning is always the sound. In analytic phonics teachers say whole words first and then analyse them to identify the sounds corresponding to the letters, if this is possible. If it is not possible then words are learnt as whole words made up of letters in a specific order. The beginning is always the sight of the letters. Personally I do not understand why the sight of the letter is not also the start of the synthetic phonic method, but I have been assured many times that the sound comes first …. ? ? Whichever way we think about it, both methods relate to children learning letters and their corresponding sounds. This seems obvious because written English is an alphabetic language. It was devised by abstracting ‘sounds’ from the spoken language and creating corresponding symbols. But these ‘sounds’ are not anything separable in spoken English. They are simply convenient categories (phonemes) for symbols (graphemes) to match. For children to become aware of them, they have to go through the learning process I have described above … not an easy task! Abstracting phonemes from spoken language to gain phonemic awareness is an abstract process that requires analysis of spoken words and what we do within our mouths and vocal chords to produce them. Until we come to learn to read and write we do not need to know this. If we can learn to recognise some words by simply remembering the sight of them – including the specific letters and their order – is this a simpler process? But this is where I started. I came across children who could not remember written words like this.